The brand-new Elizabeth Picture Theatre is located in the Heritage-listed Tara House, best known as the Old Irish Club in Elizabeth Street, and offers an affordable and quality cinema experience for moviegoers of all ages. Originally built in 1879, the building was one of the very first to be erected in what is now known as the CBD. Extensions were built in 1920 by the Irish Association, and after taking over the location two years ago, plans were drawn up for the new complex, liaising with the Heritage Department throughout the project. The Elizabeth Picture Theatre is a five-screen complex, with two cinemas in the old function rooms known as The Tara Room and The Harp Room. The ballroom ceiling from the old ballroom has been kept intact and is the showcase piece for the Tara Room. 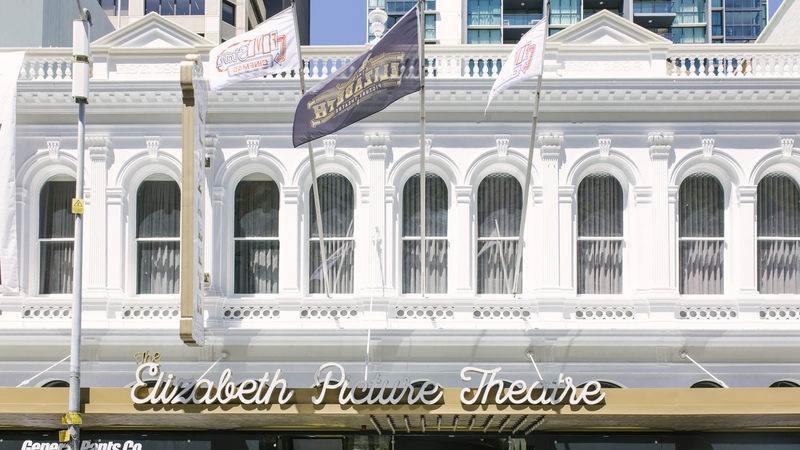 The Elizabeth Picture Theatre also features three premium cinemas we call The Royal Rooms. These opulent rooms provide luxurious full reclining seats and offer full food and beverage service to the patron’s seat. The venue has a full bar, a fully operational kitchen plus a private boardroom and an outdoor entertainment area. The seating capacity across all five cinemas is 350 patrons, giving customers a quality movie experience without the crowds and the ‘ship em in ship em out’ attitude. Plus there’s more to come, with plans already underway for a sixth and seventh cinema to be added at ground level. Dedicated to giving cinema fans a mix of retro style and state of the art sound and vision, while bringing the ‘experience’ back to a trip to the movies, they’re the third generation to work in the family business. Their grandfather Peter built the Yatala Drive-in, which he ran with his son James, the father of Peter and Stephen.